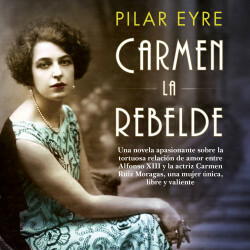 When Alfonso XIII, the King of Spain, met eyes with the theater actress Carmen Ruíz Moragas, they knew it was the beginning of an inescapable but dangerous passion. The king fell so deeply in love with Carmen, a free, exciting, beautiful, and valiant woman, that he almost made her his queen. But Carmen, an illegitimate child and a solitary person, loved the independence her profession gave her and never wanted to abandon it. Her tragic marriage to a Mexican bullfighter, which she hoped would make her a respectable lady, was the prelude to her relationship with Alfonso, which lasted eight years as full of turbulence as the fraught historical moment they were destined to live through.